Denbury Resources Inc. Jumped 80% in 2016. How Can It Keep Rising in 2017? The oil company completed several strategic initiatives that shored up its financial position, but it still has more work to do to start growing again at current oil prices. Enhanced oil recovery (EOR) specialist Denbury Resources (NYSE:DNR) roared back to life with a vengeance last year, soaring 80%. However, its stock price still sits more than 80% below its peak before oil prices crashed. That suggests the stock still has the potential for more upside. However, it needs higher oil prices as well as a few other improvements to fuel a continuation of its recovery this year. With the oil market continuing to worsen at the beginning of 2016, Denbury Resources responded by focusing on four initiatives: reducing costs, optimizing the business, cutting debt, and preserving cash and liquidity. To achieve these aims, the company slashed its capex budget 51% to just $200 million, which would cause production to be 7% to 12% below 2015's level, though about 40% of that decline was due to a decision to shut in uneconomic production. Furthermore, it worked on several other initiatives to cut costs, which resulted in a 17% year-over-year decrease in lease operating expenses by the end of the third quarter. The company also used a combination of available credit, non-core asset sales, and free cash flow to reduce debt and boost liquidity. By the end of the third quarter, Denbury's total debt was down to $2.7 billion, a $562 million improvement from the end of 2015. That helped preserve liquidity as its banks only decreased the borrowing base under its credit facility from $1.5 billion to $1.05 billion, which was not as deep a cut as other oil companies endured. DNR Debt to Capital (Quarterly) data by YCharts. 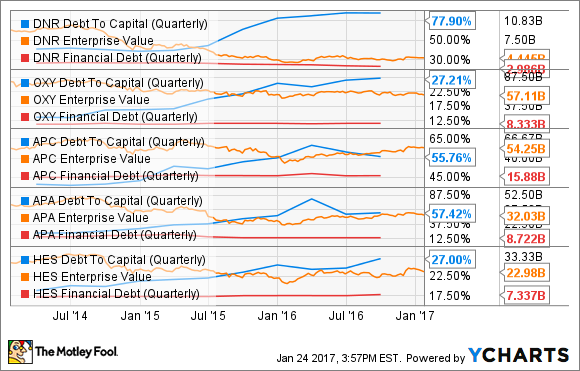 As that chart shows, not only is its debt-to-capital ratio well above these peers, but debt as a percentage of its enterprise value is 67%. That is much higher than those of Anadarko Petroleum (NYSE:APC), Apache (NYSE:APA), and Hess (NYSE:HES), which each has a roughly 30% debt-to-enterprise value, while Occidental Petroleum's (NYSE:OXY) ratio is just 15%. 5% to 8% oil and gas production growth per year over the long term. 12% to 14% compound annual oil growth rate over the next five years. 8% to 12% exit-to-exit production growth in 2017. Targeting top-tier organic production growth. Data source: Anadarko Petroleum, Hess, and Occidental Petroleum. The other crucial differentiator between Denbury and these peers is that each has a growth-focused shale position. That is critical because shale drilling costs have fallen so dramatically during the downturn that these producers can earn excellent returns and deliver robust growth at current oil prices from their shale assets. As a result, most are reinvesting the cash flow produced from conventional and EOR assets into shale wells because the returns are so much better. Because Denbury does not have the resources to become a high-growth company, its stock rally could fizzle out this year as investors focus on faster-growing producers, especially if oil prices stagnate. To avoid this fate, the company must differentiate itself from other oil companies. One way it could do that is by outlining a clear strategy to grow shareholder value, which could include bringing back the dividend. That way, it would appeal to a different subset of investors that prefer income growth over absolute growth. Denbury Resources rebounded sharply last year, thanks not only to improving oil prices but several self-help efforts that put the company on a more sustainable footing. However, despite the progress, Denbury Resources still has issues to work through, including the need to further reduce costs and debt so that it can start growing again. That said, the company does not have the ability to grow as rapidly as other producers because EOR projects take more time and money to develop than shale. That means Denbury will need to clearly differentiate itself to appeal to the right investor class who would be willing to pay a premium for the steady growth it could offer in a stable oil price environment.